As Republicans and Democrats traded blame for the impasse that led to this week’s government shutdown, President Obama said during a Rose Garden appearance Tuesday that he would not give in to demands by “one faction, of one party, of one house of Congress in one branch of government.” He was referring to the conservative GOP faction that won’t accept a budget deal without rollbacks of the health care law. 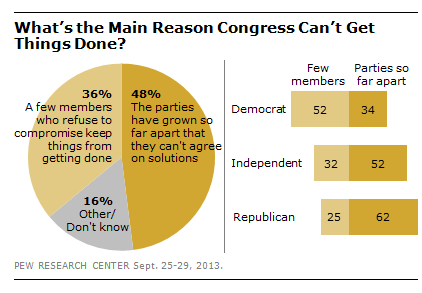 The public is of two minds about the root causes of the gridlock in Congress. A Pew Research Center survey conducted last week found that 48% of Americans believe Congress is unable to get things done because the parties have grown so far apart, they can’t agree on solutions. But 36% say the problem is that “a few members of Congress who refuse to compromise keep things from getting done.” Another 16% expressed no opinion. Democrats were twice as likely as Republicans (52% vs. 25%) to blame congressional gridlock on a few members holding things up. Republicans were more likely than Democrats (62% vs. 34%) to say this gridlock was the result of the growing distance between the parties more generally. The survey found the public almost evenly split on the question of whether the growing political divisions in Washington reflected a divided society or were mostly partisan differences among elected officials. The view that the political divisions were among lawmakers and not society more broadly was held by 44%, while 41% said they reflected a more divided American society.